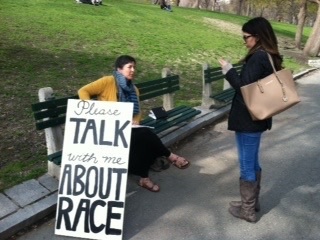 During the follow-up discussion at my Meet Me Halfway reading at the Mattapan branch of the Boston Public Library yesterday, one of the audience members suggested that we take the Please Talk With Me About Race sign to Boston Common. It was a beautiful afternoon to sit in downtown Boston’s central park and the location would offer a mix of locals, students, legislative staff from the nearby state house, tourists, and business people. Talking with Amira about being a light-skinned African immigrant raised in America. James didn’t have time to talk, but our first real co-conversants showed up a few minutes later. I heard them before they came over, two young men speaking Arabic. This should be interesting, I thought, college-aged Middle Eastern men in the post-Boston Marathon bombing era. Sattam and Majed are both students from Saudi Arabia. Sattam just arrived about four months ago and his English was limited so Majed often translated for all of us. Majed and Sattam had questions for us about race relations in America. This is one of the trends we’re seeing across cities, foreign-born people wanting to check their impressions of the race situation against our native-born assessment. Toward the end of the conversation, Sattam suggested that maybe it’s best to keep your identity hidden as much as possible, to avoid attacks. I should have taught him the word “passing,” but I didn’t; I was thinking too hard about what he said, that after only a few months in the U.S., he has deduced that it’s best to hide one’s difference. Amira, a young Algerian-born Arab woman, was shocked at first to learn that Boston one was one of the most segregated cities in the country. She was raised in East Boston, a mostly working-class neighborhood near Logan Airport where many recent immigrants live, especially Latinos. I could see how being raised there might make you think the city’s neighborhoods were diverse. Mike, an older Jewish transplant from New York, told us about his surprise at the racism in Boston when he first moved here during the 1970s battles over school integration. When he moved to Boston a second time about seven years ago, he was “desensitized” to the racism. “‘It’s just the water,’ says the fish,” he said. Mike had introduced himself with “an interesting race fact”: When W.E.B. DuBois attended a “race conference” in about 1903, 70 “races” were being discussed. “Swedish could be a race. Jewish was a race.” It wasn’t just about skin color. While we were talking to Mike, Zag and Yoshi zoomed up on their skate boards. It had clouded over while we were talking; Keren and I were getting cold. We were just about to pack up when Greg came to sit next to us. A white-haired Italian American man, Greg looked like he had just stepped off his yacht, with his soft leather loafers, shorts, and cap. He asked whether I thought what happened in Ferguson was racially motivated. I told him I thought it was, reminding him that Darren Wilson’s testimony revealed that he thought of Mike Brown as a “demon,” dehumanizing the victim. Greg asked if I thought Wilson would have shot a white man who was reaching for his gun. I said I didn’t think that the “Brown grabbed Wilson’s gun” argument had been established as fact, that witnesses reported a range of impressions of the event. I’ll admit, I had been concerned that those initial inquiries about my thoughts on Ferguson were “gotcha” questions. I’ve experienced that before, where white people push back against discussion of race by trying to trap me in some rhetorical corner, usually dealing with the need for “facts” specific to one isolated event, facts that neither of us could possibly produce. It’s an easy way to avoid discussion of systemic discrimination and institutionalized racism. But maybe Greg was just testing us out, to find out our tone and motives. He told us about how he used to work with a black man in one of the office buildings that encircle the Common. Greg’s fellow employee told him about how his father felt the need to sleep with a gun for safety and about crosses being planted in their front yard. Keren asked him where that decision to move away from the black man on the path comes from. “From what you hear on the news, from other people’s stories,” he said. Greg wished us well on our journey and we finally packed up the sign and our notes. We stopped at an arepa cart and bought two of the hot corn cakes to warm our hands and bellies. Leaving the Common, I thought about a line from the work of Yiddish poet Anna Margolin that Mike had just taught us: “Drunk from the bitter truth, I refuse all other wine.” Seems appropriate for the race-facing work Keren and I are doing. We’re drinking a lot of bitter truth, but there isn’t any other tonic, really, if America wants to truly heal.